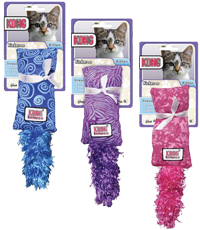 Cats absolutely love the KONG Kickeroo and Moppy Kickeroo . These unique cat toys appeal to a cat's instinctive desire to stalk and capture prey. The Kickeroo's size, shape, and material were specially chosen to promote wrestling and hind paw kicking. The fluffy tail provides movement for extra excitement, not to mention that there is a generous amount of KONG's potent catnip inside to further encourage play. Don't be surprised if the Kickeroo becomes your cat's favourite toy. KONG’s Kitten Kickeroo has all of the excitement of KONG’s standard Kickeroo but also has a fantastic crinkle sound to really drive your kitten wild. With a filling of KONG's potent catnip, adult cats will also find this toy irresistible. When the catnip scent starts to fade, simply add more fresh catnip for another round of fun! Catnip can be stored in the freezer to help keep it fresh. This toy is machine washable with the catnip removed. These soft and snuggly plush KONG Hedgehog, Beaver, Mouse and Rat catnip toys have a reclosable pouch to hold fresh catnip securely in place. Toys include a generous amount of KONG's premium catnip in a reclosable container. The unique texture of the KONG Moppy Kickeroo invites play with a fluffy tail and crinkle sound adding to the excitement. A generous amount of KONG's potent catnip inside further encourages play. Watch the natural hunting instinct take over as your cat stalks, pounces on, and attacks the KONG Moppy Ball. A rattle sound adds extra excitement to stimulate play. 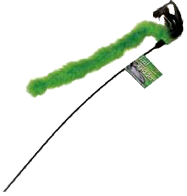 Give your cat hours of fun chasing the Pet Love Tail Tikkler. Please note that all images are for illustrative purposes only. The actual items supplied may differ in terms of presentation from those shown above.